Asia Black is an ECA stack that isn't your simple old diet pill. This is a supplement that helps create the ideal conditions for your body to burn fat as well as calories! Other Ingredients: Gelatin, Water, Blue 1, Red 3, Titanium Dioxide, Magnesium Stearate, Silicon Dioxide. Directions: As a dietary supplement, take 1-2 capsules after meals. Do not exceed 6 capsules daily. Shred that last bit of stubborn body fat and watch the gasps and stares over what you have accomplished! Burning body fat can be a tedious uphill battle especially if you are already an active person; those last few pounds can seem impossible! 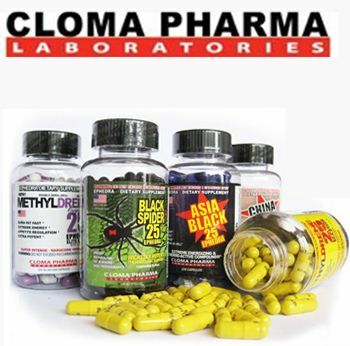 That headache has come to an end as Cloma Pharma presents Asia Black, an ECA stack that isn't your simple old diet pill. This is a supplement that helps create the ideal conditions for your body to burn fat as well as calories! If you have ever attempted to lose fat, you know that there will come a time when you just plateau. Simply put, our bodies don't like to change that much and it works hard to do that. Cloma Pharma gets fat burning, and Asia Black was specifically formulated to promote fat loss when the body has gotten used to fat loss! Asia Black by Cloma Pharma will not only help to burn body fat, but it will also help increase your energy levels so you can stay focused and energized throughout the day. With the key ingredients of Asia black being Eph, Caffeine, and White Willow Bark, your body won't be able to slow its metabolism down, and let the fat burning ensue! End your battle with stubborn body fat TODAY with Asia Black by Cloma Pharma! What are the Key Ingredients of Asia Black? L-Tyrosine: A non essential amino acid that supports performance enhancement. White Willow Bark: is the bark found in tree's, it is used for several health benefits such as muscle pain, cramps, and headaches. White Willow Bark helps accelerate the body's ability to burn fat by thinning the blood which extends the effectiveness of other thermogenic ingredients which helps increase the amount of fat burned. Yohimbe Extract: Yohimbe Extract is an alpha-2 adrenergic receptor antagonist that promotes the improved lipolysis. The yohimbe tree bark contains a chemical compound called yohimbine, which is used to make medicine and increase metabolism. Yohimbine increases the blood flow throughout the body. Yohimbe is also known to help decrease fat synthesis by increasing fatty acid mobilization. Yohimbe Extract can also support well being and mood, suppress appetite and can lead to improved libido and sexual performance in males. Warnings: Not for use by individuals under the age of 18. Do not use if pregnant or nursing. Consult a physician before using this product if you have, or have a family history of, heart disease, angina, thyroid disease, diabetes, high blood pressure, recurrent headaches, bleeding disorder, depression or other psychiatric condition, glaucoma, difficulty in urinating, prostate enlargement, or seizure disorder, if you are using a monoamine oxidase inhibitor (MAO[) or any other dietary supplement, prescription drug or over-the-counter drug containing eph, pseudoephedrine or phenylpropanolamine (ingredients found in certain decongestants, allergy, asthma, cough/cold and weight control products). The maximum recommended serving of Eph for a healthy adult is 100 mg in a 24-hour period for not more than 12 weeks. Exceeding the recommended serving or use restrictions may cause serious adverse health effects including heart attack and stroke. Side effects may occur include insomnia, nervousness, or hand-tremor. Discontinue use and call a physician immediately if you experience rapid heartbeat, dizziness, severe headache, shortness of breath or other similar symptoms. Individuals who consume caffeine with this product may experience serious adverse health effects. The patients of thyroid disease, blood pressure, heart disease, diabetes or facing any problems of urination due to prostate gland enlargement should not take the drug unless advised by the physician. The side effects are: sleeplessness, tremors, nervousness, nausea or appetite loss are also reported in some cases. Do not avoid the reading of the claim label on the container before taking this formulation or just any other dietary supplements, without avoiding complications or adverse affects.